Tonight’s game was preceded by a minute’s silence, which was interrupted by applause from both sets of fans. Manchester United manager Jose Mourinho celebrates with the trophy. MANCHESTER UNITED MANAGER Jose Mourinho said his side would give up their Europa League trophy if it would bring back the 22 victims of Monday’s terror attack in Manchester. United beat Ajax 2-0 in Stockholm on Wednesday to win the Europa League for the first time, but the game was overshadowed by the deadly suicide attack on concert-goers at Manchester Arena, which also left dozens injured. 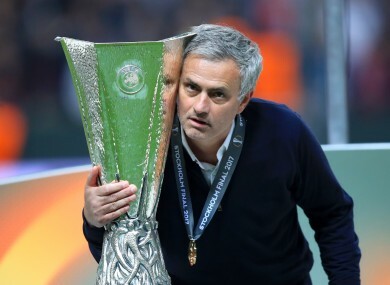 “If we could, we would obviously change the people’s lives for this cup, immediately,” Mourinho told reporters at the Friends Arena. “We wouldn’t think twice. Does this cup make the city of Manchester a little bit happier? Maybe. But we just came to do our job. The game was preceded by a minute’s silence, which was interrupted by applause from both sets of fans, and United’s players wore black armbands. Mourinho agreed with European governing body UEFA’s decision for the match to go ahead, but said the victory would always be associated with sad thoughts about what happened in Manchester. It’s really hard,” said the Portuguese, whose pre-match press conference on Tuesday was cancelled. “That’s why yesterday we didn’t want to have the press conference because we had to prepare ourselves to do our job and to try to forget events that are obviously much more important than our job. “But the world goes on. It doesn’t stop and we have to do our work. I agree with the Uefa decision to play the match. Email “'We'd exchange cup for victims' lives' - Mourinho”. Feedback on “'We'd exchange cup for victims' lives' - Mourinho”.